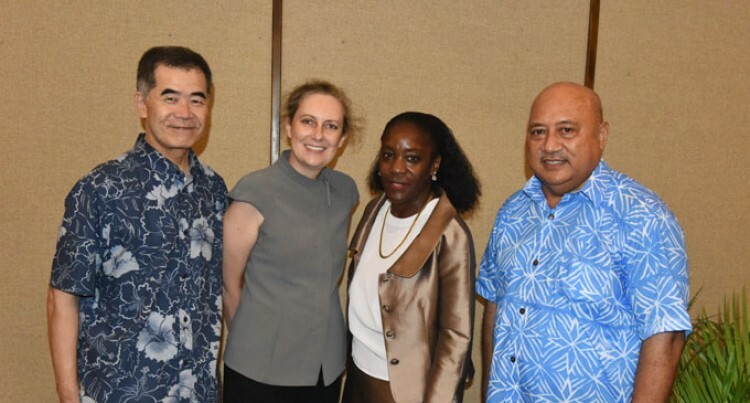 The outgoing United States of America Ambassador to Fiji, Frankie Reed, was farewelled by the Ministry of Foreign Affairs and other heads of mission at Holiday Inn Suva on Wednesday. Minister Ratu Inoke Kubuabola hosted the event. In his speech, he reminisced the good work that the ambassador had done during her four years in Fiji. “We greatly value your professionalism and the competency displayed in the conduct of your work since taking up your post in Fiji in 2011,’ Ratu Inoke said. Ms Reed was appointed Ambassador to Fiji, Kiribati, Nauru, Tonga and Tuvalu on August 3, 2011. Ratu Inoke also mentioned the efforts she had put in to maintain the relationship between Fiji and the US. “You have sought to improve the lives of ordinary Fijians through the programmes established by the US Embassy. The US government’s donor assistance, bilateral, regional and multilateral co-operation and development programmes are greatly valued and very much appreciated,” he said. Prior to Fiji Ambassador Reed served as the deputy assistant secretary in the Bureau of East Asian and Pacific Affairs, responsible for relations with Australia, New Zealand and the Pacific Islands. This covered posts in Fiji, Tonga, Kiribati, Samoa, Papua New Guinea, Vanuatu, Solomon Islands, Republic of the Marshall Islands, Federated States of Micronesia and, Palau. Ms Reed will depart today.